Summary and Definition: The Gros Ventre tribe, also known as the Atsina, originally inhabited northern Montana, the Great Lakes and along the Saskatchewan River in the Canadian Prairies. The people, who had once been members of the Arapaho confederacy, then migrated southwards to the Great Plains in the Wyoming and Colorado area to hunt buffalo where they became great allies of their neighbors the Assiniboines. The above picture depicts a Gros Ventre Native Indian wearing a blanket cloak and his finest jewelry of various ear piercings and earrings. It was painted by Karl Bodmer (1809 – 1893) a French-Swiss artist who accompanied German explorer Prince Maximilian zu Wied-Neuwied from 1832 through 1834 on his Missouri River expedition. The brave is wearing a horizontal stripe of blue paint on his lower face by the application of indigo, a dye that was plentiful in North America. The Gros Ventre also has tattoos on the chest and right arm. What was the lifestyle and culture of the Gros Ventre tribe? The Gros Ventre tribe migrated from their original homelands along the Saskatchewan River. The French name Gros Ventre means "Big Belly" but does not infer the greediness of the people. The name derives from a French misunderstanding of Native Indian sign language. The Cree tribe referred to the Gros Ventres as the 'Water Falls People', when they lived by the Saskatchewan River and the sign for this was misinterpreted. The Gros Ventre referred to themselves as 'Ahahninin' meaning "White Clay People." What was the religion and beliefs of the Gros Ventre tribe? The religion and beliefs of the Gros Ventre tribe was based on Animism that encompassed the spiritual or religious idea that the universe and all natural objects plants, animals, trees, rivers, mountains, rocks etc have souls or spirits. The Great Plains tribes such as the Gros Ventre believed in the Great Mystery. The Gros Ventre had two tribal medicine bundles or pouches which were symbols of creation and represented the Gros Ventres’ special relationship with the Great Mystery. The oldest of the medicine bundles was the Flat Pipe which was given to them when the world was created. The Feathered Pipe medicine bundle was used in rituals and ceremonies in relation to weather control and protecting the people from illness. The medicine bundles contained various herbal remedies and items used in Smudging Rituals and many sacred items representing sacred animal spirits for good luck, protection and strength in battle. Where did the Gros Ventre tribe live? The Gros Ventre are people of the Great Plains Native American cultural group. The geography of the region in which they lived dictated the lifestyle and culture of the Gros Ventre tribe. What did the Gros Ventre tribe live in? The Great Plains Gros Ventre tribe tepees that were constructed from wooden poles that were covered with weather resistant animal skins such as buffalo hides. The teepee was pyramid shaped, with flaps and openings, rounded at the base and tapering to an open smoke hole at the top. Most tepees were approximately 12 to 16 feet in diameter at the base. Tepees had hearth that was in the center of the tepee for cooking and heating. This type shelter suited the nomadic lifestyle of the Assiniboine tribe as tepees were quick to put up and easy to take down. What language did the Gros Ventre tribe speak? The Gros Ventre tribe spoke in the Gros Ventre dialect (Atsina) of the Algonquian language family. What food did the Gros Ventre tribe eat? The food that the Gros Ventre tribe ate included meat from Buffalo, elk, deer (venison), bear and wild turkey. These meats were supplemented with roots and wild vegetables such as spinach, prairie turnips and potatoes and flavored with wild herbs. Wild fruits, such as rhubarb, and berries were also added to the food supply. When food was scarce the tribe ate dried buffalo meat, called pemmican. What weapons did the Gros Ventre use? The weapons used included bows and arrows of ash, cherry wood and horn. The horn bows were covered with the skin of a rattlesnake. Other weapons included spears, stone ball clubs, hatchets, lances and knives. What clothes did the Gros Ventre wear? The men of the Gros Ventre tribe wore breechcloths, fringed buckskin tunics or shirts and leggings. 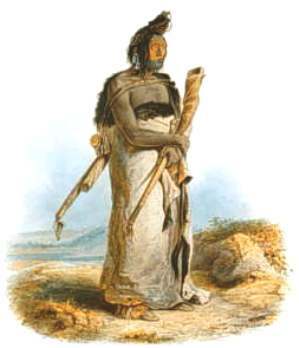 Warm buffalo robes or cloaks were also worn to protect against the cold and the rain. The Gros Ventre women wore buckskin knee-length dresses and leggings and buffalo robes during bad weather. The men and women also wore mittens and caps made from buffalo skin during the cold winter months. Gros Ventre History: What happened to the Gros Ventre tribe? The following Gros Ventre history timeline details facts, dates and famous landmarks of the people. The Gros Ventre timeline explains what happened to the people of their tribe. 1754: The Gros Ventre had their first documented contact with whites between the north and south forks of the Saskatchewan River.